To paraphrase the great poet Dylan Thomas, for this run of articles celebrating the Super Mario franchise we will begin at the beginning. Super Mario Bros. on Famicom and then the NES revolutionised the industry in terms of both gameplay and commercial success, with its impact in North America - particularly - often referenced as 'saving' the video game industry. That can always be disputed, to a degree, but a key inarguable fact is that the original Super Mario title was - and remains - hugely important to Nintendo. Often considered the trigger point for the boom in sidescrolling platformers (as well as the wider industry), its arrival on the Famicom and the NES in North America in 1985 (and then Europe in 1987) brought quite a departure from the original Mario Bros., an arcade-centric single screen experience. The key leading figures were Shigeru Miyamoto, naturally, and also Takashi Tezuka, another highly recognisable and valuable member of Nintendo's core development team in the modern day. Super Mario Bros. established a template that, in many respects, is still stringently followed today both within Nintendo's franchises and in many other platformers. Eight worlds, each culminating in boss encounters, allied with a simple narrative. Gameplay and design were the key factors, both of which have contributed to the title's ongoing value and prestige within Nintendo and beyond. In an Iwata Asks for New Super Mario Bros. Wii, some of this design principle was explained. What seems like a simple approach in the modern day was innovative and remarkable for its delivery in the early 8-Bit era, establishing Mario, Miyamoto-san and Nintendo within the broader industry. The excerpt below explains the principles at play on the very first screen. Iwata: At that point, even if you panic and try to jump out of the way (of the mushroom), you'll hit the block above you. Then just at the instant where you accept that you're done for, Mario will suddenly shake and grow bigger! You might not really know what's just happened, but at the very least, you'll realize that you haven't lost the turn. Miyamoto: But you'll wonder why Mario suddenly got larger. Iwata: You'll try jumping and see that you can jump to higher places and smash through the ceiling, so it'll be clear that you've become more powerful. Miyamoto: It's at that moment that you first realize that the mushroom is a good item. Iwata: That's the reason why it's designed so that whatever you do, you'll get the mushroom. Miyamoto: Of course it's because we wanted the player to realize that this item was different from a Goomba. Iwata: When I first realized that this had all been designed with that purpose in mind, I was really taken aback. When you tell people who weren't aware of it that the start of Super Mario Bros. was designed with this intention, it's rare that they won't be impressed. Though its successors would trump it on a technical level, as an early NES title (though it was actually later in the lifecycle and a pre-Famicom Disk game in Japan) Super Mario Bros. delivered notable successes within limited hardware. In another Iwata Asks for the Super Mario 25th Anniversary, conducted by Shigesato Itoi, Miyamoto-san explains the smaller scale nature of a project such as Super Mario Bros, and how creating the fantasy world of the Mushroom Kingdom necessitated simple design decisions. Miyamoto: Yeah. (laughs) When I came up with Mario, I probably drew up like one other option. A rough sketch. In pencil. Miyamoto: Yeah, I didn't have any ulterior motives, such as to draw one another just to make the one I liked look better to be chosen in the end, I just ended up drawing two somehow. After all, at that time, I was making the artwork and plans practically all by myself and only after everything was all finished we would ask, "How are we gonna sell this?" In other words, no one checked my work. The programmer was happy only if I just drew something and took it to him. Itoi: So you just polished up option A.
Miyamoto: Yeah. But we were making the software for the NES system back then, so there were also capacity limits. Miyamoto: Having said that, however, even when we are facing such limitations as capacity constraints, if anything bothers me, I would really apply myself to it. 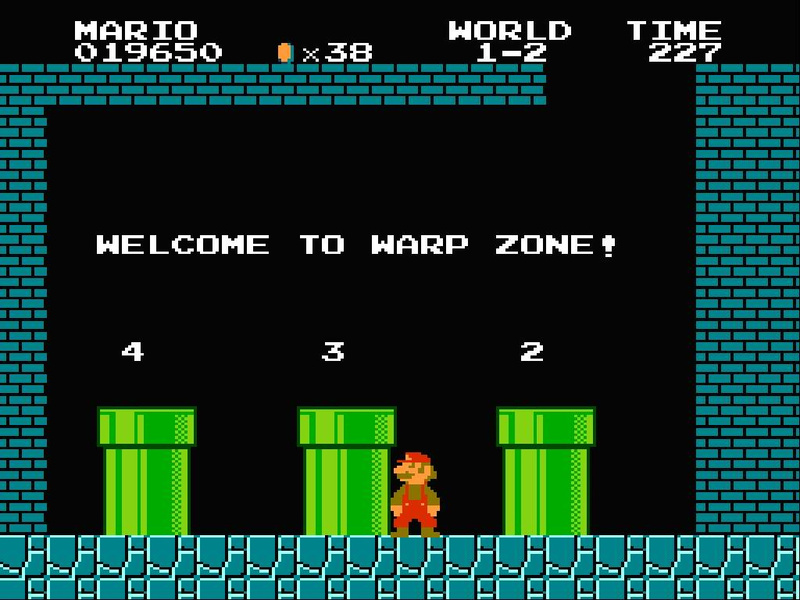 For example, deciding to have Mario enter a Warp Pipe from the top. Having him cross in front of it from the side wouldn't work. Miyamoto: And you know how you suddenly go underground after you clear World 1-1? Miyamoto: I thought it was strange how Mario was already standing there underground when that level begins. Why is Mario, who just passed in front of a castle, standing underground? I couldn't fit in a sequence showing him falling underground, so I decided to have him just plop down from the top of the screen, and-surprisingly-that was just fine. If someone had said, "You should provide a little more detail here," it would have turned out differently. Upon its release in North America, in particular, the pop culture and games industry impact of Super Mario Bros. truly took hold. The NES became a sales phenomenon, and for many years the 40 million+ sales of Super Mario Bros. - helped by hugely popular hardware bundles - made it the biggest selling video game of all time. Wii Sports ultimately trumped that record courtesy of its bundling with the Wii in the West. Though the original Mario Bros. is a notable part of Nintendo's history, and that of its iconic mascot, it was Super Mario Bros. that launched the IP into the public consciousness and became a key driving force for Nintendo. Its power-ups, shortcuts and platforming tropes would evolve into maintaining an extraordinary hold over gaming culture. Right down to Koji Kondo soundtrack, the seeds planted and developed from this title have grown hugely throughout the world. It will, of course, be integral to marketing for Super Mario Maker. The level creation tool is being tied to an Anniversary of the game, naturally, and the original will see quirky new life in user-created stages that utilise the classic's template. 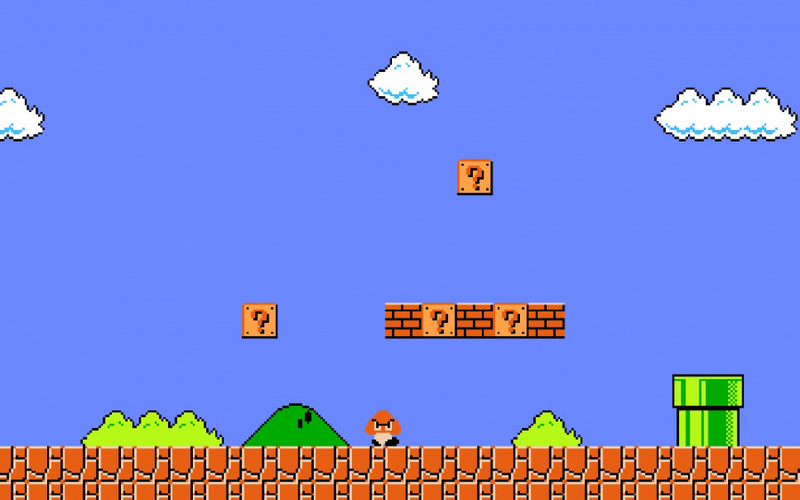 Many are still drawn to its charms, despite the evolution seen in Super Mario Bros. 3, the revamped physics of Super Mario World or the HD sheen of New Super Mario Bros. U. It says much for its design that even now, 30 years on, it can be hugely satisfying - and challenging - taking on a run of the game either on a retro system or the Virtual Console. Super Mario Bros., perhaps more than any game before it or since, defined the Nintendo identity and established its place in pop-culture. Without this particular smash hit the gaming world would have turned out rather differently. A classic in every sense of the word. Some people have a song they listen to when they are sad or generally bummed that cheers them up. Some people have a movie that does that for them. For me, World 1-1 is my security blanket of choice. When I need a break from the world, if something has me really down, or if I need to just reconnect with my childhood I grab my 3DS, or my Wii U and go right for Super Mario Bros. I never play all the way through except on rare occasion. Really just getting through the end of 1-2 and warping is enough. I love this game. It's the first video game I remember playing way back in 1986 when I was 5. It's still with me to this day. I remember drawing out areas on paper in 6th grade trying to explain secrets such as the negative world to show other friends how to get there. It is still a great game. I actually think I appreciate it's graphics more now then I did back then. I wonder if Nintendo decides to keep the developer interviews going, who should take over? Itoi did a great job, even if his methods are quite unconventional! 30 years later and this game is still relevant, even by today standards. Sure the successors and many other platformers is superior by definition, but this game set the standard for side-scrolling platformer and has been the example of a good game design. This is the game that changed video games for me and turned me into a gamer , the Mario series is to this day my favorite gaming series as well Mario is the main reason I buy every system Nintendo releases to this day ., Long live KING MARIO ! I remember going to a friends house to play this and being hooked. It was unlike anything I had played at that point (Intellivision, Odyssey II, and C-64). It wasn't long after that I got my own NES under the Christmas tree. While the Legend of Zelda game that was there with it became my favorite, Super Mario Bros was still a joy to play and a masterpiece of level design. Must be a slow news day, but Super Mario Bros. is a landmark in gaming history for sure. @Chaotic_Eevee Someone didn't read a word past the sub-title. SMB is a true classic. The level design and the way the developers teach you the game as it goes was brilliant. "Changing the gaming industry forever", rather starting, or kicking off the industry. I had played the game on NES (still have the cart), but I never beat it until getting the GBA release. I kinda cheesed it via warping, but I remember beating it several times over with that method. Felt rather proud of myself. I think I got to world 7 or 8 without warps, but, man, whether you can hold on to a Fire Flower can make or break your playthrough. The sequels might be technically superior. But for me, the first Super Mario, is still my favorite in the series. A great game for its time and is still great even 30 years later. Its still a great game, even if it got trumped by its younger NES siblings and its still a fantastic start to a fun franchise. Its very, very rare that a Mario game will disappoint me. I'll admit that this wasn't my first Mario game (that would be Super Mario World), but I appreciate this game in a historical sense. This game helped gaming out of a slump and invaded pop culture, as well as being integral to many a gamer's life. I personally feel any gamer should experience this game at least once, to appreciate gaming history and know how great a simple game can be. I look forward to seeing the rest of the articles in this series. Going down Mario history is something I'm very excited for! I have only played SMB through Amiibo Tap and Smash's Retro Thingy, but I guess it paved the way to my favorite two mario games being SM64 and SM3DW. @Chaotic_Eevee That comment doesn't make any sense. Like the article brought out SMB (arguably) saved the gaming industry, and for that reason I cherish this game, however it helped lead to the creation of another game I love:Sonic the Hedgehog. @SquirrelNuts I am exactly the same! When I just want to switch off from the world I either play through Super Mario Bros or Super Mario Bros 3 for 20-30 minutes. Never understood the Nostalgia for Super Mario bros. Super Mario 3 and Super Mario World on the SNES, yeah those were good (cheese bridge was the first cherished hurdle when I was a child). I had a ZX Spectrum so I always compared the first Mario to Jet set Willy or Dan Dare (the original Metroid in my eyes), I actually preffered those games as a young child (long live QA OP).Even games we get today like Fire emblem and advance wars were arguably based on Rebel Star (long live leader Krennon and Ben Kenobi), released years before Nintendo surfaced (even longer here in the U.K). So no, I don't think Nintendo saved anything, at least in the U.K. If anything games took a turn for the worse, until Sega showed up, THEN Nintendo upped their game with SNES imo. Definitely the SNES was when Nintendo hit their stride, again I had an Amiga at the same time which was brilliant-4 player Hired guns with my 3 brothers, times to cherish especially now we are all old an Games never went the direction any of us wanted. I guess they could have had him walking in from the side too. The one issue being that the player might think they could walk back the other way and exit the level. In which case they could maybe have a block or some blocks coming down behind him to block the entrance off, like when you enter the boss rooms in Mega Man, or falling down like the entrance had just caved in. It's interesting the different ways you could approach the same situation, but they came up with a really nice and simple solution, that most people probably never even noticed or thought about. Not the Super Mario All-Stars version though, as I think that loses some of the charm of the original. Although overall I totally prefer the SMA-S versions of these classic NES games more in general—although they're still great either way. Even though I was born many years after the release of the original Super Mario Bros, it was the first game I ever played. 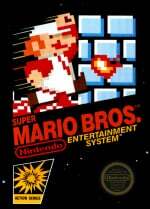 My older siblings had an NES and the first game they let me play was SMB. So many memories with this game. @Konda You would be thinking of the Magnavox Odyssey, and later the Home Pong, Telsrar and Nintendo Color TV Game from the 70's if you want the start of the industry. I got started as a kid with the second generation (Intellivision and Odyssey II) along with the C-64 (although that probably is considered third gen) when it came out and remember the crash to an extent. Nintendo NES and the Sega Master System brought about the comeback of the industry when they started the third generation. And as I said, Super Mario Bros 3 was probably one of the best made games for the NES system.